Backpacking Philippines: Where "Cowboys" Eat in Cebu! Where "Cowboys" Eat in Cebu! While on the way to SM, Tutubi spotted this restaurant with a funny name along the way. 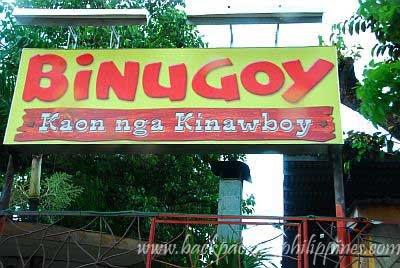 Binugoy Restaurant, as Tutubi understood it, name came from the root word bugoy, word to describe to man who can't seem to do anything right. "Kaon nga kinawboy" means you eat like a cowboy i.e. can be comfortable even in unusual situations and not be squeamish. Binugoy, from the looks of it, looks like an upscale carinderia (eatery) from the outside. Never got to sample food but will try to do so next time. So its just like eating in simplicity without any kyeme or kaartihan. I can still remember my College days in Cebu which the city is so crowded yet a nice to visit.